It now looks like the big media and leaders in both parties are no longer focusing on the Government Shutdown crisis, but are now moving on to the notion that the shutdown is melding with the upcoming probable breaching of the debt limit to create a combined mother of all fiscal crises. Along with this, the media and many politicians, encouraged by the President’s standing “strong, strong, strong,” are now directing attention away from whether ObamaCare will be delayed or compromised, to other types of ransom the Administration might pay in return for both re-opening the Government and also providing an increase of an undetermined amount in the debt limit. Meanwhile there are reports that under increasing Wall Street pressure John Boehner is preparing to negotiate with House Democrats and allow a vote to pass a CR and a clean debt limit increase bill, in return for concessions he can take back to his caucus. TINA does not apply in this case, and the President’s choices are not limited to just refusing to negotiate or giving in to ransom demands whether focused on Obamacare, the Keystone Pipeline, entitlement cuts,“tax reform frameworks” or any other measures that give “tea party” Republicans “the respect” they think is due them. By continuing to frame things in this way, the media and politicians in both parties are echoing the Administration’s framing of the situation and absolving the President of his share of the blame for the debt limit crisis. 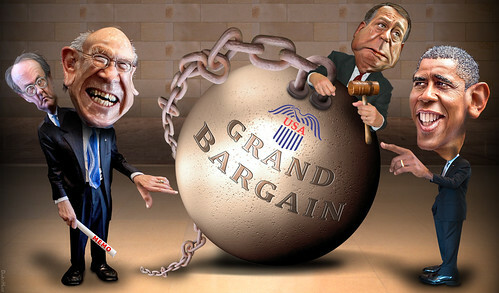 They are also preparing the way for a compromise, that will, almost certainly, result in hurtful cuts to Government spending including renewed consideration of “the Great Betrayal,” also known as the Grand Bargain, and probably passage of the chained CPI cuts to Social Security over the objections of a large majority of the American people. 4. Using the authority of the 14th Amendment to keep issuing debt in defiance of the debt ceiling, while declaring that the debt ceiling legislation was unconstitutional because it violated the 14th Amendment in the context of Congressional appropriations passed after the debt ceiling mandating deficit spending. 5. Beowulf has offered yet a fifth option for getting around the debt ceiling by issuing consols. Consols are debt instruments that pay a fixed rate on interest in perpetuity, but never promise principal repayment at a maturity date. The debt ceiling law is written in such a way that what counts against the ceiling is the principal repayment guaranteed by the instrument. Since consols provide no principal repayment, one can have unlimited consol issuance without increasing the debt-subject-to-the-limit. “. . . the larger point is that this budgetary Battle of the Titans is a phony war. Obama can finesse the Republicans if he needs to. . . . So hang tight for way too much unnecessary melodrama over the next month. It’s another round of watching the two parties play chicken, with each posturing that it won’t be the one to steer out of the impending crash. The fact is that Obama really wants his Grand Bargain. All of this high drama is necessary for him to pretend to his base that he was forced to do what he’s been trying to do for years: sacrifice old people since he perversely believes that “reforming” Social Security and Medicare will get him brownie points in the presidential legacy ledger. . . .
Yves and I agree on that. The Administration is raising the zombie Grand Bargain, Great Betrayal again. It probably did so at the White House meeting with John Boehner on October 2, 2013. And Boehner promptly went back to his caucus and began to boost that as target of negotiation. The result? The “unnecessary melodrama” is exactly what’s exploding in the media right now as the shutdown crisis morphs into a combined shutdown/debt limit crisis, intended to end with the Grand Bargain, evolves. In this crisis, the Government shutdown, however much harm it is causing in the short term, is secondary in importance. The reason why is that the pressure to end the shutdown is too great for the Republicans to bear for very long. Remove their power in the debt limit crisis, and they will fold before too many days are up as more and more pressure builds from the the media, the public, the contractors, and Wall Street, and as they have to face the fact that they are destroying their chances to even retain the House, much less win the Senate. That’s because the shutdown harms their brand and exposes them to opprobrium each day. They can put on costumes, pretend to defend WW II veterans, or propose to just fund programs whose shutdown impacts are hitting the press on any given day, all they want. But that won’t change the fact, that they perpetrated one too many hostage-takings and tried to get a ransom that the President is unwilling to pay, and that a majority of people think that the hostage-taking was illegitimate, and that it is they who are responsible for the shutdown. So, the longer the shutdown goes on, the greater will be the anger of the public at them and at the tea party. If they let it go much longer, it will finish them politically until the memory of what they did fades from public consciousness. So, if their power over the debt limit is removed from them, then they will fold on the shutdown before too long. I give them only a few days at the outside if and when the President removes the threat of default from breach of the debt limit out of the equation. These reasons are all important, but they’re less than fully compelling if you believe that the risk of default due to the debt ceiling is real and increasingly high, and if you also believe that the country and the President are in a box and TINA applies. But if you believe that the President can use even one of the options I’ve listed, then you have the 9th and most important reason why the Democrats ought to stand firm and never vote for the Grand Bargain or any of its elements. That reason is that no bargain at all is necessary to defuse the debt limit aspect of the crisis because the President can do that any time he cares to. TINA is BS. No ransom need be paid. There is a choice. So, for anyone who wants to see a resolution of the present crisis on terms that do not involve any further concessions from Democrats who have already given in on a CR continuing the sequester, it’s very important that the blogosphere start debating the options for handling the debt ceiling law once again, as it did in 2011 and during the fiscal cliff/sequester periods, so the President will find it more difficult to plead TINA when he wants make his Grand Bargain. The TINA/kabuki game he and the village media are playing is the enemy of the economy, the safety net, and the public purpose. To stop it from coming about, the first thing we must do is unmask the news networks, the cable media, and the village progressives, as actively attempting to constrain debate by ignoring the options the President has, apart from a simple “I will not negotiate, or I must cave in stance.” Let us make them come to grips with the alternatives and, in doing so, spread the news that there are a number available, and that whatever unpalatable compromises the President proposes, are his choices and his fault; not necessary expedients he is being forced into because he has no effective weapons to use in countering the Republicans using the debt limit law to take hostages. We must remove any TINA cover, not just for the President, but for the Democrats in the Congress, so that it will be clear that if they support the President in any chained CPI cuts or Grand Bargain, they will pay dearly for it in the 2014 elections. Could the Treasury skip the rigamarole and pay its bills without bonds? Economically, sure. Why doesn’t it? Well, the Fed has regulations governing “overdrafts” — but apart from these, the answer is plain: to do so would expose the “public debt” as a fiction, and the debt ceiling as a sham. Under present law, Jack Lew could even pay off public debt held by the Federal Reserve by issuing a high-value, legal-tender coin – so long as the coin happened to be platinum. A coin is not debt, so that simple exchange would retire the Fed’s debt holdings and lower the total public debt below any given ceiling. Jamie always goes to the heart of the matter with admirably simple language, and puts the coin into the larger context that the United States, fiat sovereign that it is, doesn’t need to borrow to spend, and right now can create “debt free” money by using platinum coins. Right now, things are going well for the Democrats. The Republicans and the tea party are increasingly the villains of this piece, and the Democrats are largely escaping blame and positioning themselves well for 2014. But, if it is clear that they are voting for a settlement of this crisis that sacrifices part of the safety net, while claiming TINA, when no one any longer believes that TINA is true, then they will pay the price for that vote. So, to the extent we can spread knowledge of these alternatives, we can constrain them from agreeing to any Grand Bargain with the Republicans, and we will have succeeded in blocking it until the next attempt to legislate it. Yes, there will be another attempt. If a clean CR extends for too short a period, the GB may come back next month, or in December, even if the debt limit threat is also taken off the table. If not then, it will probably not return for most of fiscal 2014; but once the elections are over and there is a lame duck Congress again, then the Grand Bargain will re-appear because many of the defeated and retiring Congresspeople and Senators will then be subject to influence from the austerity forces led by the Peterson network of organizations and the various lobbyists who can offer lucrative post-Congress careers. Another mainstream outlet has now started mentioning the coin. The Center for American Progress (mouthpiece for the third way and the Administration) (h/t DEC Blogger) offers this by way of an interview of Mark Patterson by Ezra Klein, who felt his “I am terrified” framework slipping a bit today, probably when Jamie Galbraith came out for the coin in the Times. ”EK: If you’re this worried and the consequences are this bad, why not do something like declaring the debt ceiling unconstitutional under the 14th amendment or minting the coin? MP: It’s been my view and the view of pretty much everyone in Treasury and everyone in the administration that if there was a viable legal strategy that could take the threat of default off the table we would eagerly embrace it. It’s not as though people in the administration were or are closed to cool, interesting, viable possibilities. But the things we’ve been presented haven’t withstood that scrutiny. The coin is a clever, nifty idea but it has problems. The one that gets overlooked the most is it wouldn’t actually make everything normal after it was invoked. It would be subjected to all kinds of challenges and litigation. As a straightforward matter the Federal Reserve wouldn’t give Treasury a trillion dollars for that coin. We looked carefully at it, but for both practical and legal reasons, the legal reason being the law obviously wasn’t meant for anything like this and the practical reason being that the Federal Reserve would need to cooperate and wouldn’t, it wouldn’t work. The 14th Amendment shares similar problems in which you would invoke a constitutional crisis of sorts. One side would say the president broke the law and should be impeached. That would occupy all the oxygen in Washington. That’s not a reason not to do it if it’s the right thing to do. But if the objective is keeping our status as the safest and best investment in the world you’ve created all kinds of doubts about us. I don’t think proponents have thought enough about what would happen after you did it. Atrios has already replied to the coin comment by characterizing it as “argle-bargle” and pointing out correctly that the language of the legislation authorizing it is completely clear and “intent” doesn’t matter. However there are a number of other points to be made here. First, WaPo, Ezra, Mark Patterson and CAP are not the most credible sources of criticism for this, since all like to function as Administration mouthpieces and want “entitlement reform,” aka at least chained CPI,” and generally a full-blown Grand Bargain. All have also previously rejected the coin idea, and when criticized in detail for their positions on these matters refuse to respond with rational arguments, but engage in labeling and name-calling and putting forward claims about the likely consequences supported by neither evidence nor logic, but only the intuitions of the DC village. Sure, there will be legal challenges to the coin, but there’s much analysis from the coin side about why these challenges will fail, and the weight of opinion about the coin seems to be that it would be legal. All this is discussed comprehensively in my well-reviewed e-book, which Klein, Patterson, and the White House have had plenty of time to review. And certainly while those challenges are going on, the President could be drastically reducing the debt subject to the limit by using coin proceeds to pay back debt, increasing confidence in markets with every significant payoff. Of course, this depends on whether the President mints a High Value Platinum Coin (HVPC), say $60 Trillion in face value, rather than “a small ball” TDC alternative, but that’s his choice, after all. As for the Fed, it may or may not cooperate with the Executive on crediting the coin; but the law provides that in cases of disagreement in interpretation between the Fed Chair and the Secretary Treasury that the view of the Secretary shall prevail. In other words the Fed can be made to cooperate when it comes to crediting the coin, and it is highly doubtful that if the Fed is between the rock and the hard place of crediting the coin or allowing a default, that it will then choose the latter and risk the financial system collapsing. The Fed, after all, is pretty chicken about financial system crashes, and is likely to embrace its own version of TINA, since, in addition to the rock and the hard place, the Fed’s compliance is unambiguously required in the law. Patterson’s view is also off-base when it comes to the 14th amendment, because his view about the illegality of appealing to it gives the wrong reason. The right one is that the President is bound by the amendment to not allow a default, and as long as he has options like platinum coins, and consols available, he is obligated to exhaust those before he takes action on the basis that the debt ceiling law is preventing him from fulfilling his obligations. As long as those exist. It is not.